Nope not even when you add in all the gang violence in the major cities, but I think we both agree it is still to high. It is not as simple here, we are still a large mostly rural nation, in my yard weekly, I have rattlesnakes, coyotes and pigs that are large enough to destroy all my crops overnight. I carry when I am outside, not because I fear people, I have stock to protect. The media over plays everything but an AR15 is a hunting weapon where I am. Australia is pretty similar to US in terms of rurality. And Australia is not a gun free nation after that law. But having 1 rifle per farm in the US would be enough to hunt coyotes. City people don't need guns like you do. What happened in Australia is that people who did not need their gun for hunting gave it back. To get a new one you have o justify it, self defense not being an acceptable answer. The results were amazing. Considering the number of mass murder you face, you should give it a try. And one more time Australian were not forced to give up on their weapons, they were given an opportunity to sell them to the police for destruction. With such a law you can keep your gun, so no prob for you. It would/could work in places but our stats of 300+million weapons make it impossible. Especially when you consider most antiques are not included in the 300 million number. I say "give it a try". Who knows. If it is every tried it needs to be in an high crime area first, disarming some guy in Iowa solves nothing, tests nothing and could piss off the guy in Iowa. 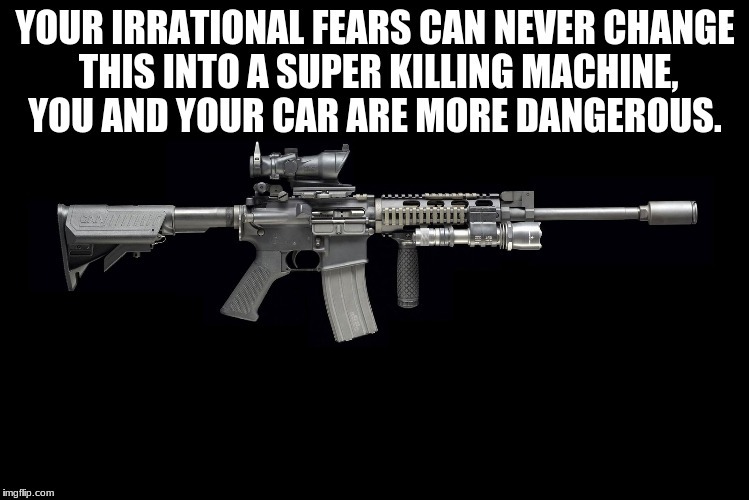 YOUR IRRATIONAL FEARS CAN NEVER CHANGE THIS INTO A SUPER KILLING MACHINE, YOU AND YOUR CAR ARE MORE DANGEROUS.